Home » Posts Tagged "mountain lion"
I had a feeling from the beginning of July, 2012, that the upcoming hunting season was going to be special. But by the end of the bear opener, which only resulted in the discovery of a virtually fruitless huckleberry crop, I was convinced this intuition had to be referring to the elk bowhunting season just two weeks away. For me, elk camp is one of those big occasions I look forward to, in part because in certain areas of Washington’s public forestlands, you can purchase a multi-game license that allows you to harvest a black bear, a cougar, and a black-tail deer; all while hunting elk. When I entered the dark, unassuming elk woods in early September, 2011, I never imagined what I was going to walk out with only a few short hours later. It was the second day of the elk bow season in Washington, but it was the night before opener that seemed to set the stage for the unexpected that was going to be the theme for this elk hunting trip. Every fall, one cannot help but find stories of elk camps, deer camps and duck camps in the shiny pages of hunting magazines all over the country. And for good reason. Sharing the excitement is part of the excitement itself. How does that old adage go? Sorrow shared is half the sorrow; joy shared is twice the joy. Never is that sentiment more in-your-face than in hunting camps everywhere. Our first organized bear camp, in the mountains of Washington in August of 2010, was no exception. Our party consisted of three guys. Two of us shot our bear on that trip. I did not. Like most good friends and hunting companions, when we left camp after that long weekend, I was genuinely happy for my comrades. But just because I was happy for them didn’t mean I wasn’t disappointed. I am always disappointed when I am not successful…at anything. But I usually don’t flog myself or stop eating out of self-contempt; I just do what any other obsessed hunter would do: try again. Left: Mountain Lion. Right: Black Bear. 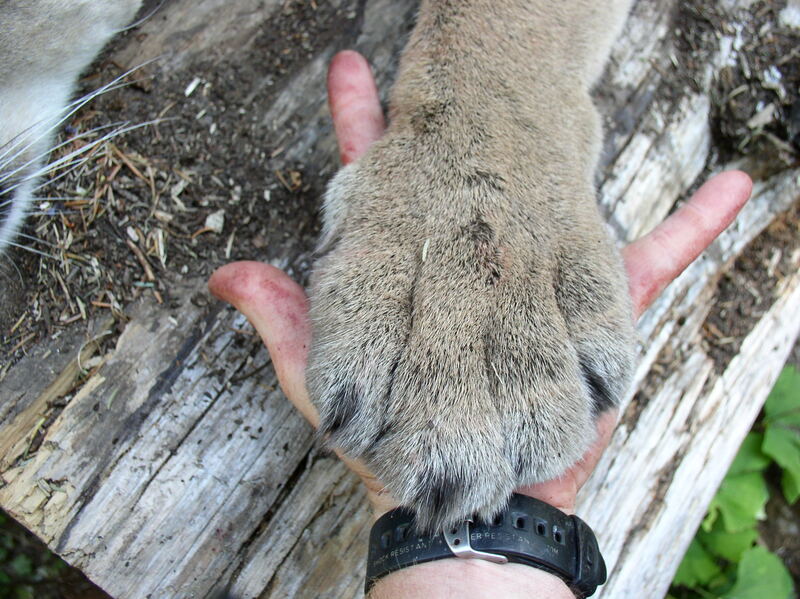 Most often when we talk about predators, especially those in the North American mountainous wilderness, we lump black bears and cougars in the same breath. Both are generally considered more dangerous than a coyote or bobcat, but not quite as dangerous as a brown bear…probably a notion justified by sheer size alone. I’ve been very fortunate to have had the amazing experience of harvesting these two predators in recent years, and while the taxidermist is completing the mounts, I paid a few extra dollars to have the skulls cleaned, boiled and bleached (of sorts…not sure of the exact chemical). Yeah, I probably could have messed around with it myself, but that is exactly what I would have created in the process: a mess. Needless to say, I believe it was well worth it. 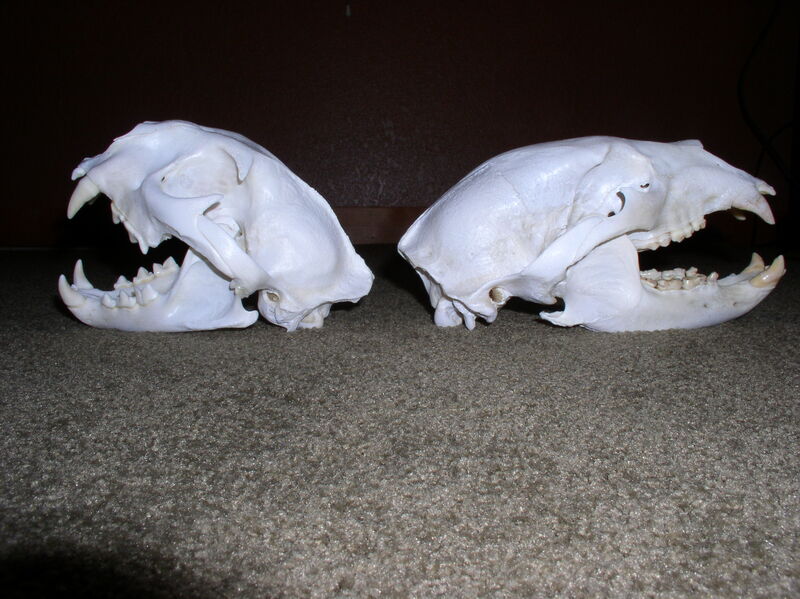 Obviously bears and cats are classified in two different families, but the differences have never been so glaring as when I began to take a closer look at their skulls. There is a lot to be learned about the differences between the animals, their behavior, and therefore, how to hunt them. The first obvious difference between the two skulls is the length and shape. While the cat’s head is short and compact, the bears head, especially the nasal canal, is much longer. So what? This tells me several things. SMELL. Bear wins… hands down. There is an old Sioux Indian adage that goes: “The eagle sees a leaf fall in the forest. The deer hears a leaf fall in the forest. The bear smells a leaf fall in the forest.” In looking at the length of the snout, this is no wonder. Quite simply, many more olfactory receptors fit there, as opposed to the cat. And like dogs, having a long snout allows a greater volume of scent to linger in the canal, and for a longer period of time. We’re not in Iowa, Toto: Bowhunting Mountain Whitetails. 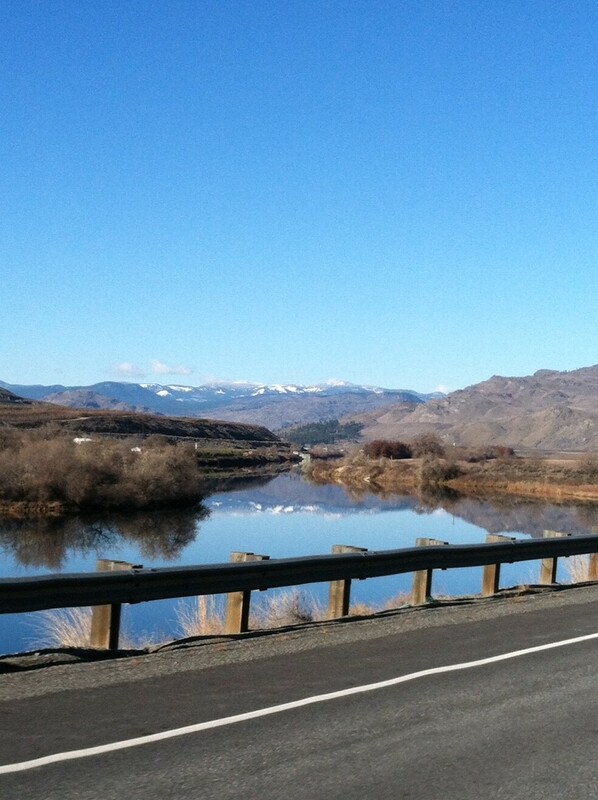 Destination: whitetail hunting the snow-capped mountains in the distance. Growing up in the rolling hills of NE Iowa, I’ve hunted whitetail deer with a shotgun several times in the eighties and nineties; typically on small, partially wooded farms that were owned by friends or relatives. Now living in the Pacific Northwest, I don’t have the option of an affordable, private property hunt. So I did what any maniacal, masochistic hunter would do: I took up bow hunting— the same year I decided to chase the whitetails that roamed the public mountains of eastern Washington. To add to the challenge of hunting such an elusive beast in such a fashion, I intended to settle for nothing less than a mature buck, and I wanted to take him while hunting from the ground. No trail cams. No food plots. No ground blind. No baiting. No guides. Oh, and I have to mention, in this state, over-the-counter bowhunters aren’t even afforded the opportunity to hunt the pre- or peak rut! Yeah, this is where the maniacal part comes in. I’d be honored and thrilled to hunt any deer in true “Midwest fashion,” but I just didn’t have the connections, pocketbook, or time to do it here. In addition, the mountainous, public-land geography of this state doesn’t lend itself to such an undertaking. Although my home farm in Iowa is now a whitetail bow-hunting Mecca thanks to efforts of my older brother, Larry; I have never hunted whitetails there with a bow or from a stand. “It can’t be all that different than elk hunting,” I convinced myself. Ha. I’ve hunted mature elk successfully, and truth be told, this is a lot tougher. But I love to challenge myself, and I love the experience of having the experience. After several years, several encounters, and countless heart-breaks in my back pocket, I knew it could be done. It was only a matter of time before the perfect scenario would present itself. There was nearly three inches of snow blanketing the forest floor as I left my truck behind in the darkness. It was parked on an old forest service road that my buddy Rich Sandstrom and I affectionately named, “The Number 2 Road,” for being the second area where you could pull off the main forest service road. It was 5:30 in the morning and the woods were black, but I knew the area well. I had been hunting this particular part of the Okanogan National Forest—in fact parking in the same spot—for six years in search of the wily animal. I’ve had several close encounters with true record book bucks, but I haven’t harvested a single deer in this area. It was a dry and cold 17 degrees Fahrenheit, exactly 34 degrees warmer than my last experience at the same stand. But that’s a whole other, bone-chilling story. That’s also where the masochistic part comes in. I climbed to the top of the ladder and then up several small pine branches another three feet to reach my platform (In 2010, I broke down and hung a treestand, but to this day it remains fruitless). I hung my headlamp and bow, and started the ritual of dressing for standing still all day. Layers and layers of warm clothing, binoculars strapped on, range finder in my coat pocket, and on and on with gadgets and invaluable tricks of the trade. Writer, hunter, hiker, biker, runner. Lover of the great outdoors. Check out my books at www.PatrickThier.com. Receive automatic updates and new posts, and I will NEVER sell or give away your email address! Mountain Lion w/ a bow. Black Bear w/ a bow. Bull Elk w/ a bow. Black Bear w/ a rifle. Whitetail Buck w/ a bow. Blacktail Buck w/ a bow. Need sun? 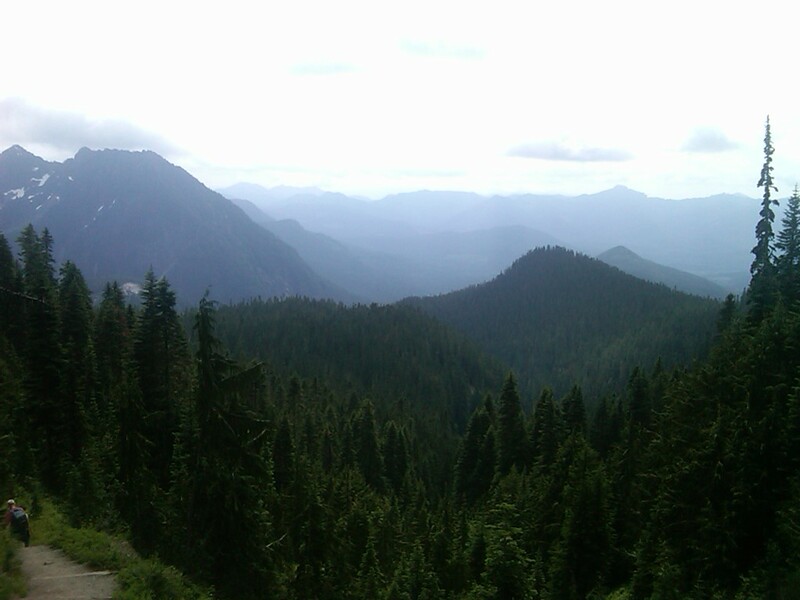 Climb a mountain. Black Bears: Please stop charging me!